Stereotactic body radiation therapy (SBRT) can be a preferred choice of treatment for some small localized tumors because of the higher efficacy of tumor control and lower complication of normal tissues. SBRT is often delivered on linear accelerator either using three-dimensional (3D) conformal radiation treatment, intensity modulated radiation therapy (IMRT) or volumetric modulated arc therapy (VMAT). Individual merits of each modality can be argued. However, a consensus is appearing in favor of VMAT.,,,,,,, VMAT plans, in general, are more conformal and less radiation dose with shorter treatment time that can be advantageous for SBRT. The SBRT treatments can be demanding of a high gradient, fast dose fall-off to achieve planning target volume coverage and sparing of adjacent normal tissues. To achieve this goal, optimal beam modeling is essential for accurate dose calculation, in particular, for complex plans such as IMRT/VMAT. Treatment planning systems (TPS) employ a sophisticated inverse optimization algorithm to create the desired VMAT treatment plan by modulating gantry speed, leaf speed, and dose rate. The TPS has to be commissioned with an optimized beam model before it can be used for clinical dose calculation. Most modern TPS are analytical in nature and processed based on measured data.,, The commissioning process involves accurate beam data measurement, dose calculation modeling, and extensive validation tests. Beam modeling of a modern dose calculation algorithm is usually performed by fitting the measured beam data with the calculation for a given dose algorithm. A VMAT plan is generated by many irregularly shaped, often with small multileaf collimator (MLC) segments. It is particularly critical of beam data for small fields and the modeling of MLC dose profile ,, among many factors affecting the dosimetric accuracy of a beam model. Some commercial planning systems allow for users to adjust a number of beam parameters to optimize the model. Others provide very limited tuning of parameters for beam data configurations thus possibly compromising in beam modeling. It has been shown that dose calculation of VMAT plans is subtly related to the modeling of small field penumbra and tails as well as the rounded MLC leaf ends.,,,,, In Eclipse TPS (Varian Medical System, Palo Alto, USA), penumbra can be adjusted by effective target spot size in X/Y direction, but a discrepancy often exists if the measurement was less accurate, for example, inappropriate detector is used for small fields. For MLC leaf ends, Eclipse provides one simplified parameter, the dosimetric leaf gap (DLG), to model the dose profile of the rounded leaf ends (Eclipse Algorithms Reference guide). The DLG is defined as the width of transmitted dose profile through closed leaf ends. Apparently, the value of DLG would be a function of beam energy, leaf position (distance from central axis) due to beam divergence, segment size, and possibly leaf motion for a given MLC configuration of leaf thickness and radius of MLC leaf curvature. It has shown  that DLG is insensitive to variations in SSD (following correction for geometric projection), depth of measurement, dose rate, and ionization chamber. LoSasso et al. provided a method to measure the DLG. 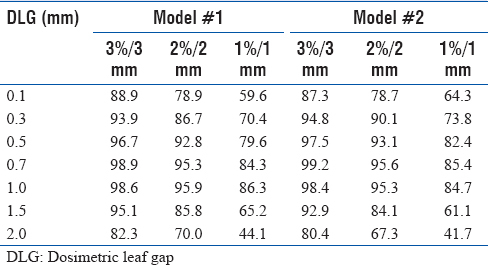 Effect of MLC leaf gap has been extensively studied in respect to its effect in treatment planning.,, Vendor-specific guidelines are also available such as Eclipse (Varian Medical System, Eclipse reference guideline) and Pinnacle (Philips Medical System reference guideline). Using sliding slit technique recommended by Varian, a single DLG value can be measured. When the measured value is used in the beam model, there are controversial point of views: some studies , have shown a good agreement of calculated and delivered plans for VMAT, whereas others , have pointed out a significant discrepancies. As a result, those highly modulated VMAT plans would likely experience a low Gamma passing rate  in quality assurance for verification of dose calculation. It is argued that the value of DLG used in the beam model has to be optimized with clinical VMAT plans instead of the measured value.,,,,, We believe that the different findings reported might be related to the variations of the beam model each user-generated as well as the validation tests they performed. The quality of a beam model should be the combined effect of the beam data used, and the fitting parameters applied. This study explored the beam model generated by two different sets of beam data in association of varied DLGs used in the model. We attempted to validate a beam model by examining the accuracy of dose calculation of VMAT plans, particularly for SBRT. We investigated two beam models for 6 MV flattening filter free (FFF) photon beam because it is a preferred choice of beam for the SBRT. In addition, FFF beams can be operated at very high dose rate (6MV-1400 MU/min) on a Varian TrueBeam. The anisotropic analytical algorithm (AAA) is modeled in Eclipse TPS version 13.7 for 6 MV FFF on Varian TrueBeam Edge. The Edge machine is equipped with Varian high definition 120 MLC leaves, which consists of 40 pairs of leaves at 2.5 mm width each and 20 pairs of leaves at 5.0 mm width, all with a 16 cm radius of curvature. TrueBeam Edge is designed, especially for SBRT treatment due to its sharper beam penumbra and higher mechanical accuracy. Two complete sets of beam data were collected independently for 6 MV FFF beam, with the open field output factors shared. The MLC transmission used the measured value of 1% and 1.1%, respectively. One set of PDD and profiles were measured with IBA CC13 scanning chamber (0.13 cm 3, effective volume) for all field sizes from 2 × 2 up to 40 cm × 40 cm. Other sets of data were scanned with small volume (0.07 cm 3, effective volume) PTW (PTW, Freiburg, Germany) ionization chamber 31021 for field sizes from 2 × 2 to 40 cm × 40 cm. The AAA dose calculation models were generated by fitting PDD and profiles to the beam data, following the standard beam data configurations in Eclipse TPS version 13.7 (Varian Medical Systems, Palo, Alto, CA, USA). All the fitting parameters were calculated by the modeling software in the system. A few parameters are made available for users to tweak the optimization, one being effective target spot size and another DLG or MLC transmission. Summarized in [Table 1] is the comparison of the beam data configuration for these two models under study. Based on the Gamma errors (Eclipse beam model reference guide), both models have a reasonably good quality, but a subtle difference can be observed in penumbra region for small MLC fields. The detailed modeling and validation process for a high energy photon beam is described elsewhere., This study is focused on the dosimetric accuracy of VMAT plans in relation to the quality of a beam model. Several clinical SBRT cases were selected for VMAT planning, including lung and spine. It usually requires a high degree of modulation to produce a good VMAT plan for SBRT cases because of the tight dose constraints. Each VMAT plan was optimized in Eclipse 13.7 with 6 MVFFF beam and jaw tracking to minimize the impact of MLC transmission, and the dose was calculated with the AAA model. [Table 2] shows the results of characteristics for these VMAT plans. The measurement was performed using a commercial QA device, ArcCHECK (Sun Nuclear, Melbourne, FL). Verification plans for each case were calculated with the fixed MU from the same optimization plan to ArcCHECK phantom with varied DLGs from 0.1 mm to 2.0 mm (an increment of 0.2 mm to 0.5 mm) in each model. The 3D Gamma analysis was performed using ArcCHECK patient QA software to evaluate the agreement of the measured dose with the calculated dose from each verification plan. All the analysis is based on absolute dose, DTA, 10% threshold and global maximum setting. An optimal DLG is generated from the maximum passing rate of Gamma analysis, for which a polynomial fitting function was employed. 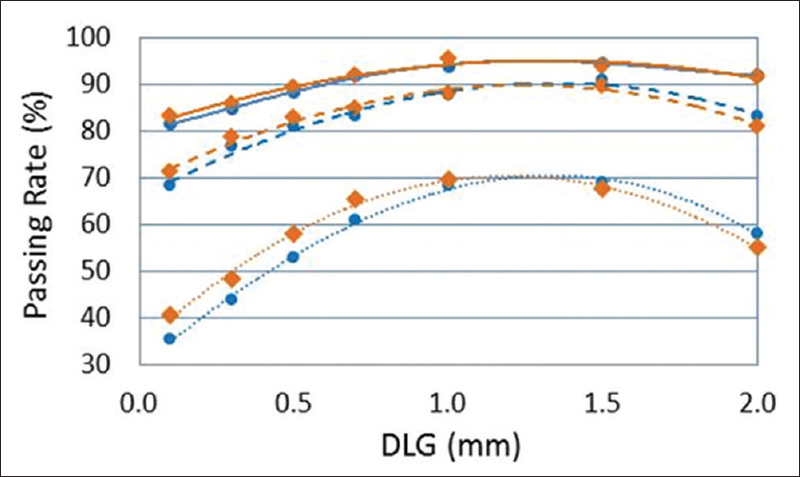 For each case under study, verification plans were calculated for seven different DLGs (range: 0.1 mm to 2.0 mm) and then compared with the measurement. [Table 3] presents the Gamma passing rate at 3%/3 mm, 2%/2 mm, 1%/1 mm criteria for case #1. Plotted in [Figure 1] are the Gamma analysis results for four lung cases on the same model. [Figure 2] compares the Gamma analysis results for the same case with different models. The Gamma passing rate apparently varies with lower percentage toward both small and large DLGs. A polynomial function up to the 3rd degree was found to fit well for each set of 7 plotted points representing the varied DLG values. [Table 4] provides the example of polynomial functions for one of the lung cases (Y denotes Gamma passing rate in percentage and X denotes the variable of DLG in mm). Median R2 value of all fitting curves was 0.990 (range, 0.920–0.999) and 0.972 (range, 0.902–0.999) for model #1 and model #2, respectively. We derived DLG that gives the maximum passing rate by solving each of the polynomial function. [Table 5] presents those DLGs for each case. We determined the optimal DLG for each beam model to be the average, 1.16 mm for model #1 and 1.10 mm for model #2. 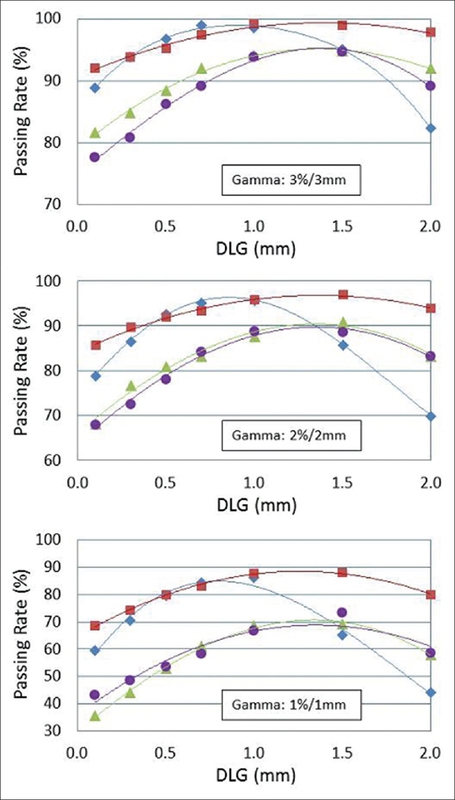 When the optimal DLG is applied back to each model, the average Gamma passing rate would be 97.1% (range, 94.6%– 99.1%) for model #1 and 97.1% (range, 94.8%–99.1%) for model #2 at 3%/3 mm, and 93.5% (range, 89.0%–96.5%) for model #1 and 93.3% (range, 88.8%–96.7%) for model #2 at 2%/2 mm. The dosimetric accuracy of VMAT plans has shown considerable dependence on the DLG with a polynomial relationship, which is less dependent on beam models. The optimal DLG that leads to the maximum agreement in patient-specific QA between the calculation and the measurement can vary to the extent of a few tenth millimeters from plan to plan. The beam modeling software in Eclipse is designed to have a minimum variation in beam data configurations. Therefore, DLG plays a significant role for those highly modulated dose plans. The DLG in Eclipse system is truly a factor of dose modulation. It is also noted that the optimal DLG is not site specific as other studies have suggested., However, an average value can be derived and applied to a particular beam model. The optimal DLG values determined in this study were based on all SBRT cases, which had small field sizes from 5 cm to 8 cm, so plans were all segmented by central MLC leaves of 2.5 mm width only. The measured DLG value following the vendor's sliding slit technique would not generate an optimum beam model because of the complexity of beam modulation in clinical plans, particularly VMAT plans for SBRT. The results of this study support other publications ,,,, that DLG should be a fitting parameter in the beam modeling of Eclipse AAA dose calculation algorithm. The optimal DLG value can be simply determined for a model using several clinical VMAT cases, which preferably are modulated to different degrees of complexity. Nevertheless, small uncertainty as demonstrated by the standard deviation of six cases should have justified the validity of the proposed method. This DLG value is truly a single simplified parameter to achieve the best yet compromised fitting for the beam model in general. We used Gamma analysis of VMAT plans delivered to an ArcCHECK device that is a widely available QA device to verify the dosimetric accuracy of IMRT or VMAT plans. It uses helical diode array to measure dose distribution projected to a circular phantom with the machine delivering the same treatment as for a patient. This QA tool is among one of the instrumentations recommended by the recently published MPPG 9.a. Guideline for patient-specific QA. Although the resolution of ArcCHECK device is not as high as other QA tools, such as film and amorphous silicon electronic portal imaging device, its sensitivity is proven reliable. It is beyond the scope of this study but would be interesting to cross-check our method using different QA tools. We believe that the optimal DLG value as derived by the proposed method should have a minimum variation with QA tools used, a sample size of plans selected and treatment sites. Several studies , have shown that the measured DLG value used for the beam model is acceptable for VMAT plans. However, one of these studies  did not specify what kind of VMAT cases were used for the validation tests. Nevertheless, their measured DLGs were already way larger than the nominal ones, e.g., 0.71 mm and 0.89 mm for 6XFFF and 10XFFF beams, respectively. One possible reason was that they had an older version of TrueBeam software before 2.0 when Varian changed the MLC calibration technique, which led to lower DLG values. In addition, their results were based on less tight Gamma analysis (90% passing rate at 3%/3 mm and 5% threshold). Another study  used TG-119 test cases but did not provide the DLG values for the beam model. We also demonstrated that a single optimal DLG value can be determined for a beam model, regardless of treatment sites. The fitting function of Gamma passing rate has shown different curvatures and maximum passing rates for each patient case and each Gamma criterion. There is no simple metrics found to provide a meaningful correlation with the complexity of modulation. The curve can be quite flat for less modulated plans so less sensitive to the variation in the DLG value. Data seem to converge reasonably to one average optimal DLG value, which would generate the desired model for each beam energy. The dosimetric accuracy of a beam model in Eclipse TPS appears insensitive to the beam data measurement, but quite sensitive to the DLG parameter. The sliding slit technique suggested by Varian for the measurement of DLG has an apparent deficiency to produce the optimal value for an accurate beam model. Dosimetric effect of the rounded leaf ends can be complex, especially for those modulated beams, which varies with leaf position, segment size, beam energy, and possibly leaf speed. Some TPS (e.g., Pinnacle) employs a leaf offset calibration table to model the variation effect of the rounded leaf ends. Eclipse uses DLG as a single parameter to fit the beam model. As demonstrated, an optimal DLG should be used in the beam model for the best overall dosimetric accuracy achievable. Dosimetric accuracy of VMAT plans is associated with the quality of a beam model. For highly modulated VMAT plans, for example, most SBRT cases, the dosimetric effect of rounded leaf ends becomes critical to determine the dose distribution achievable, particularly for high dose gradient regions. The modeling of AAA dose calculation algorithm is relatively straightforward in Eclipse TPS with a few fitting parameters available for users to adjust. However, the DLG plays an important role in the dosimetric accuracy of a beam model. The measured DLG would not provide the best model for VMAT plans. The study revealed a simple yet practical method to derive the optimal DLG for each beam model. This single DLG value should be valid to plan VMAT cases of different treatment sites with the expectation of high dosimetric accuracy. Benedict SH, Yenice KM, Followill D, Galvin JM, Hinson W, Kavanagh B, et al. 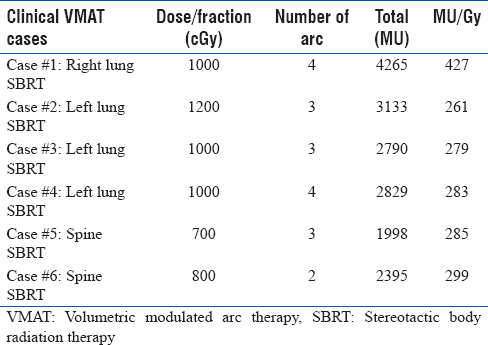 Stereotactic body radiation therapy: The report of AAPM task group 101. Med Phys 2010;37:4078-101. Lechner W, Kragl G, Georg D. Evaluation of treatment plan quality of IMRT and VMAT with and without flattening filter using pareto optimal fronts. Radiother Oncol 2013;109:437-41. Hussein M, South CP, Barry MA, Adams EJ, Jordan TJ, Stewart AJ, et al. Clinical validation and benchmarking of knowledge-based IMRT and VMAT treatment planning in pelvic anatomy. Radiother Oncol 2016;120:473-9. Broggi S, Perna L, Bonsignore F, Rinaldin G, Fiorino C, Chiara A, et al. Static and rotational intensity modulated techniques for head-neck cancer radiotherapy: A planning comparison. Phys Med 2014;30:973-9. Stieler F, Wolff D, Schmid H, Welzel G, Wenz F, Lohr F, et al. A comparison of several modulated radiotherapy techniques for head and neck cancer and dosimetric validation of VMAT. Radiother Oncol 2011;101:388-93. Wiehle R, Knippen S, Grosu AL, Bruggmoser G, Hodapp N. VMAT and step-and-shoot IMRT in head and neck cancer: A comparative plan analysis. Strahlenther Onkol 2011;187:820-5. Jeong Y, Lee SW, Kwak J, Cho I, Yoon SM, Kim JH, et al. A dosimetric comparison of volumetric modulated arc therapy (VMAT) and non-coplanar intensity modulated radiotherapy (IMRT) for nasal cavity and paranasal sinus cancer. Radiat Oncol 2014;9:193. Verbakel WF, Cuijpers JP, Hoffmans D, Bieker M, Slotman BJ, Senan S, et al. Volumetric intensity-modulated arc therapy vs. conventional IMRT in head-and-neck cancer: A comparative planning and dosimetric study. Int J Radiat Oncol Biol Phys 2009;74:252-9. Ahnesjö A. Collapsed cone convolution of radiant energy for photon dose calculation in heterogeneous media. Med Phys 1989;16:577-92. Ahnesjö A, Andreo P, Brahme A. Calculation and application of point spread functions for treatment planning with high energy photon beams. Acta Oncol 1987;26:49-56. Gershkevitsh E, Pesznyak C, Petrovic B, Grezdo J, Chelminski K, do Carmo Lopes M, et al. Dosimetric inter-institutional comparison in european radiotherapy centres: Results of IAEA supported treatment planning system audit. Acta Oncol 2014;53:628-36. Kairn T, Charles P, Crowe SB, Trapp JV. Effects of inaccurate small field dose measurements on calculated treatment doses. Australas Phys Eng Sci Med 2016;39:747-53. Xue J, Ohrt JD, Fan J, Balter P, Park JH, Kim L, et al. Validation of treatment planning dose calculations: Experience working with MPPG 5.a. Int J Med Phys Clin Eng Radiat Oncol 2017;6:57-72. Kim LH, Malajovich I, Reyhan ML, Xue J, Park JH. Effect of beam profile measurement on arc therapy plan quality assurance: A case study. J Appl Clin Med Phys 2017;18:52-5. Xu Z, Wang IZ, Kumaraswamy LK, Podgorsak MB. Evaluation of dosimetric effect caused by slowing with multi-leaf collimator (MLC) leaves for volumetric modulated arc therapy (VMAT). Radiol Oncol 2016;50:121-8. Kumaraswamy LK, Schmitt JD, Bailey DW, Xu ZZ, Podgorsak MB. Spatial variation of dosimetric leaf gap and its impact on dose delivery. Med Phys 2014;41:111711. Kumaraswamy LK, Xu Z, Bailey DW, Schmitt JD, Podgorsak MB. Evaluation of fluence-based dose delivery incorporating the spatial variation of dosimetric leaf gap (DLG). J Appl Clin Med Phys 2016;17:12-21. Mullins J, DeBlois F, Syme A. Experimental characterization of the dosimetric leaf gap. Biomed Phys Eng Express 2016;2:065013. LoSasso T, Chui CS, Ling CC. Comprehensive quality assurance for the delivery of intensity modulated radiotherapy with a multileaf collimator used in the dynamic mode. Med Phys 2001;28:2209-19. Valdes G, Scheuermann R, Hung CY, Olszanski A, Bellerive M, Solberg TD, et al. A mathematical framework for virtual IMRT QA using machine learning. Med Phys 2016;43:4323. Younge KC, Roberts D, Janes LA, Anderson C, Moran JM, Matuszak MM, et al. Predicting deliverability of volumetric-modulated arc therapy (VMAT) plans using aperture complexity analysis. J Appl Clin Med Phys 2016;17:124-31. Chang Z, Wu Q, Adamson J, Ren L, Bowsher J, Yan H, et al. Commissioning and dosimetric characteristics of trueBeam system: Composite data of three TrueBeam machines. Med Phys 2012;39:6981-7018. Glide-Hurst C, Bellon M, Foster R, Altunbas C, Speiser M, Altman M, et al. Commissioning of the varian trueBeam linear accelerator: A multi-institutional study. Med Phys 2013;40:031719. Szpala S, Cao F, Kohli K. On using the dosimetric leaf gap to model the rounded leaf ends in VMAT/RapidArc plans. J Appl Clin Med Phys 2014;15:4484. Kielar KN, Mok E, Hsu A, Wang L, Luxton G. Verification of dosimetric accuracy on the trueBeam STx: Rounded leaf effect of the high definition MLC. Med Phys 2012;39:6360-71. Middlebrook ND, Sutherland B, Kairn T. Optimization of the dosimetric leaf gap for use in planning VMAT treatments of spine SABR cases. J Appl Clin Med Phys 2017;18:133-9. Crowe SB, Kairn T, Middlebrook N, Sutherland B, Hill B, Kenny J, et al. Examination of the properties of IMRT and VMAT beams and evaluation against pre-treatment quality assurance results. Phys Med Biol 2015;60:2587-601. Smilowitz JB, Das IJ, Feygelman V, Fraass BA, Kry SF, Marshall IR, et al. AAPM medical physics practice guideline 5.a. : Commissioning and QA of treatment planning dose calculations – Megavoltage photon and electron beams. J Appl Clin Med Phys 2015;16:14-34. Halvorsen PH, Cirino E, Das IJ, Garrett JA, Yang J, Yin FF, et al. AAPM-RSS medical physics practice guideline 9.a. For SRS-SBRT. J Appl Clin Med Phys 2017;18:10-21.